I posted something similar to this on Bolter and Chainsword in the Dark Angels forum a while back and thought I might expand on it here. I wanted to know how often people made changes to their army lists. Do you make a change after each game or do you make a list and then play that for a while? The reason I ask is becasue I believe people spend way too much time testing out new units (for just one game unfortunately) instead of learning to play each one fully before deciding to use them or not in their list. Like the title says, it's not your army that loses, it's you. I think it's that players spend more time looking for units that can do it for them instead of learning how to really use the units they love to play with. With my Lustwing, I originally wrote the list, built the army and played 5 games without changing anything. After that, I realised I needed some form of close combat help if I wanted to do better with the list overall. But, I had to ask myself how much of the original army composition was I willing to sacrifice in order to improve my record. I'd already started to see a trend despite my attempts at using the force in different ways, under different conditions against different opponents. So... I added a pair of lightning claws to each squad. I decided I was going to keep my army composition fairly close to my original plan since I liked the all foot-slogging force and would try only a small change. I made that one alteration and then went 5 more games before thinking about changing anything. It wasn't that I needed to drop units or overhaul my force completely. It wasn't that my all footslogging force couldn't win or my force was built "wrong" and I didn't have unit XYZ like the internet says you must have. I simply learned that after 5 games, I had a common thread of needing a little more close combat punch. I've won more games than I've lost with that army too. Once I took the time to learn how to use an all foot-slogging Deathwing effectively. Jump ahead to my Mechanised Deathwing list. I've played 4 games and haven't changed anything yet. Have I lost, sure, have I won... you bet. But I'm still learning what I need to do to play the list as best as possible as opposed to what units need to be switched out or dropped or whatever so I can win. Like I'm going to swap out a unit and all of a sudden it's magically going to fall into place and I'll never lose again. Seriously? You regular readers might remember a recent post I had about incorporating Forge World rules into my list. When I built my mech list, I had 40 points sitting around that I wasn't doing anything with. Now I have a use for them... a slight improvement to my two dreadnoughts and an extra weapon for my Land Raiders. But it's Forge World stuff so most people won't play me now. Here's another perfect example... Belial. 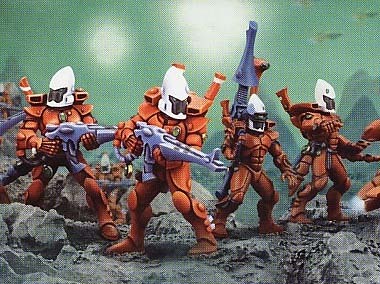 Any Eldar Guardian with a butter knife can give him a run for his money. The trick is learning how to use him effectively. Maybe a better question would be "Is he worth learning how to use?" He's certainly not be the best Space Marine HQ out there, but once you learn when and how to use him, he can make the difference. You see, I like my list the way it is and I refuse to drop units because someone else says they are "ineffective." Is it me or is it the unit that doesn't do well on the battlefield? Is the unit really that bad or am I such a poor General that I don't know how to use the units I've chosen to their maximum lethality. Make enough changes to your army because you're looking for the win, and you'll wake up one day and look at your army wondering how you got there. Don't get me wrong, I like to win. But I like playing with the army I want to more. What kind of list do you build? Army building, do you build what you really want? Agreed. I would normally play up to 10 times to know how to use a particular unit. After games I would also ask my opponents about how my unit worked and how it should. I change my list for every event, heck I change the theme of the army also most of the times. Ofcourse I am playing my unpainted marines so I have tons of units to try and very little game time. 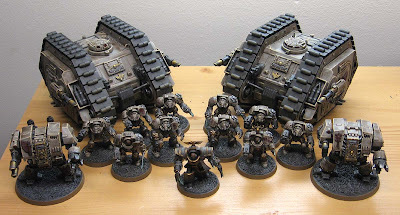 In fact I think it has been like 6 months since I played a game of 40K. Blood bowl games and space hulk have been played in that time but no 40K. If you don't know your units and their variations (x-tra claws is a variation:)), how can you know your army? It's really two parts, the tactics of knowing how to play each unit and the strategy of knowing how they work together and what tasks they have in the army. It's also about paying attention and knowing why each success and failure came about. Did unit X fail? Why? Did it shoot every round or just one? Did you manover it efficiently? Did it do its job or did it try to fill another job? Got any more examples of little changes you've made and why you did what you did? the only recommendations i ever make for people who ask me about their list usually has to do with wargear. 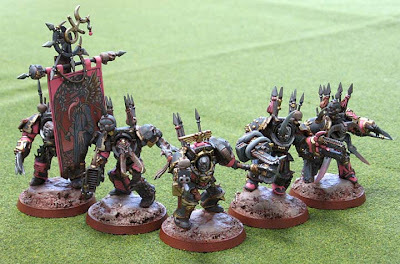 Small tweaks like maybe not taking that plasma pistol with that PF sarge, or perhaps giving some of your plague marines meltaguns instead of giving all of them plasma gun. Or maybe giving any of your units something other than plasma! sorry, it just seems to be a recurring problem i see in lists. Great advice for anyone learning the game. I know I often ask myself what I wanted a unit to do and can I expect that unit to do what I want. By doing that it helps to identify your playing style a little bit, and you can build your list to complement your play style. If you don't know what you want a unit to be doing, you could play 1000 games, and not be able to determine if they fit in your list or not. For examples, in your case, you wanted your army to convey a certain them. Once you identified that, you tweaked it to be fun to play and do what you want. Your point about testing the list and getting used to its components is well-taken. I'll agree with you that anyone can and will misuse any given unit. Of course, I'll counterpoint this with the part where not all units and not all armies are created equally. But still, you can't downplay the human element. There's the weapon, and the hand holding the weapon. Either of them can fail. As a tournament player, I can boldy state that sometimes it is your list. But in the arena of highly competitive play, you not only need a strong list, but you need to know how to play it well. Not only that, but you need to know your opponent's force equally well. For more casual games where it comes down to slight army list tweaks and tactics gained from battlefield experience, I have to agree with you Ron. Getting used to a list that you play is certainly a must. I like to have an extra unit or two in my lists that I can rotate in and out every few games, just to keep things interesting for my regular opponents! But as Adam says, at higher competitive levels, it is the list _and_ how you play it sometimes. How very true! Rather like the rest of your post! I'm someone who will spend time when I write the list, but then once its settled I tend to stick with it for better or worse. My only major concern with Belial is his lack of 4+ Invul. Otherwise I have had great results with him and I think he makes a very fluffy 1st Company Captain for anyone using the DW rules. I do wish his wargear could be a little better though. Maybe master crafted claws or hammer? Ive run the same marine list for the last 10-15 games and remain unbeaten. Its taken me a while to get to the point where I am comfortable with the units I have. I've only just started playing again after a long hiatus, so at the moment I'm changing my list quite a bit but this is more about trying the various models I've painted over the past year. Over the year, I'll be aiming to put together an all commers list that I'll be taking to the GT but first, I need to get a feel for my units. All my lists I test drive several times over and make note of how units performa and wargear etc. I also can try different tactics. Take my Imperial Guard army. I had flamers in my CCS, it didn't work. So I took plasmas. They worked better. I now take plasmas and a medi-kit which works a lot better with those get hot rolls. Took a few games and tests to find the flamers didn't work for me, medi-kit was just a obivous choice. I used to take a executioner. With its high points cost it never made it back. I swapped for a standard battle tank which works a lot better. Sometimes its just trial and error and live and learn. Play testing several times if the way forward. You work out weak units and get replacements for them, find new tactics and use wargear which might be more suited for you. And here I thought I might get a much more negative reaction from this post. I suspect if I posted this on a bulletin board, the reaction would be completely different. Flekkzo: You make a good point about looking at "why" a unit did the way it did on the battlefield. GMSN: It's amazing how much just wargear can change things though. Adam: I don't have much tournament experience... none really. I should have maybe added that little bit to the post. Uou're right--you have to gain experience with an army to see what works and what doesn't before you start to tweak it. I just wish I played enough to try this out out. Usually by the time I play 5 times with a single army, a new codex is out for it! This is a concept that comes up a lot in tournament Magic: The Gathering as well. People play in a tournament, don't do well, blame their deck list, and then start changing it or look for a new one. What they fail to see is that it is much more productive to dwell on why you didn't do well. More often than not it has less to do with the list and more to do with your own play. The problem is that this requires a good bit of self criticism and most people don't like to be self critical. They tend to look for external things to blame. "My list was bad." "I got bad matchups." "I had bad luck." All of these excuses are just the brain's way to avoid self doubt/criticism. Learning to play a list is really important. Learning to analyze a game to determine what went right and what went wrong is critical to becoming a better player. If a player is genuinely interested in getting better at the game, learning to analyze their mistakes should be the number one priority. Of course none of this is to say that a list can't be perfected and shouldn't be tinkered with. I just mean that players should stop and think about their motivation for the change. Is it because they genuinely feel that the list is lacking in some strategic or tactical way, or did they just lose a game and are looking for an easy thing to blame. I agree... heck, I'd go so far as to say that nearly every unit is good, you just have to figure out it's synergy with other units. I remember when I built my LatD list. I took all the units that everyone said were crap and made a pretty nasty army that kicked quite a bit of tail. Anyway, I think folks play, see that a unit doesn't do well once and drop em for something else. You should take the time to MAKE the unit work. Not only do you learn a lot about the unit, but you learn a lot about all the units in the process. I've been playing my Wolfwing as it was initially written up for a couple months now. I've played 7 games and I've won 4, lost 2, tied 2. Each time I play I see things I'd like to adjust on my list, like adding a Rune Priest, but I don't want to change anything without having a good understanding of the strength and weaknesses of the list. I don't see how that's possible after facing 1 or 2 opponents. Sometimes, you might want to face the same army several times. Perhaps it was a fluke, bad dice, bad day, bad decisions. Any number of things can lead to a loss that aren't strictly the fault of the army or the list. Just my opinion, of course, and that doesn't mean I'm never changing, just not so fast. I am a bit different.I know 3 players besides me,and as a result we play a couple games over Christmas break, and several more over summer vacation (we're all in high school. As a result, if I want to test a unit I generally have 1 game to test it out to see if I like/need it. Anon: I can see where your "testing" might be limited. Only playing a few games every now and then can make it tough, it's even harder if those games are against the same opponents over and over again. I still think the best way to judge the effectiveness of a unit is to use it against a number of players/armies in as many games as possible. I'd go so far as to say even trying to use the unit in question differently in as many games as possible to force yourself to see how they operate in different situations.